The battle in Chicago against the aliens starts to take a turn for the worst when Malcolm Dragon, Angel and Jennifer Murphy are all overwhelmed by the superior numbers. Dragon and Marsha are left alone against the horde but are saved by the timely arrival of the S.O.S. SuperPatriot leads his teammates and orders that they take no prisoners and simply eradicate this invasion force. As this fight escalates, the various heroes begin to experience strange new memories. Mister Glum had identified the correct reality that Angel Dragon hailed from and after rewiring some of the machinery around him, merges two realities. This gives everyone the memories of their counterparts from this other reality which contains some horrifying experiences. 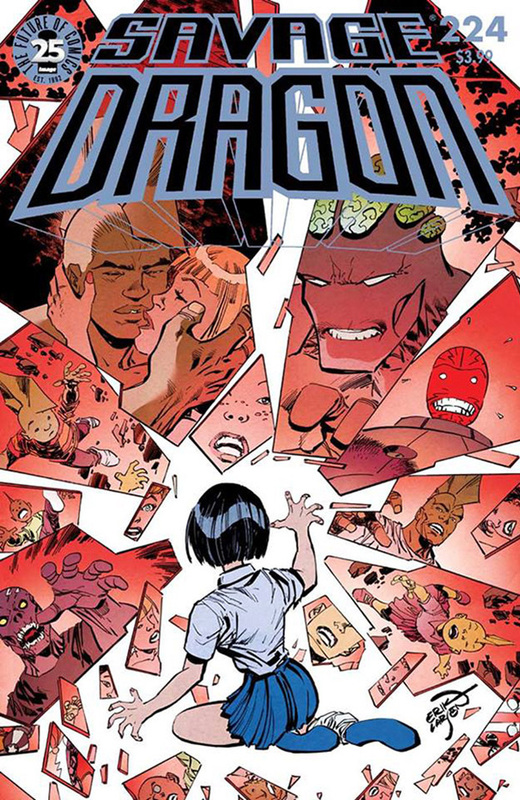 Mighty Man accidentally killed her mothr, SuperPatriot was brutally murdered by Dragon, Malcolm and Angel ended up as a couple which left Maxine all alone. A startled Maxine is rescued from the aliens’ destruction by Thunder-Head who is also distracted, this time by his own new memories as a hardened criminal. The portal to Dimension-X remains open and more invaders pour through which prompts Malcolm and Battle Girl to leap through to try and prevent any more aliens reaching Earth. They have bonded further over their new memories as a happy couple, something that Mister Glum cannot abide. He has no new memories with his Angel and suspects that her affections remain elsewhere and so he merges another universe. This new reality has Malcolm marrying Tierra whilst Angel marries Frank and Dragon ends up marrying Alex Wilde. SuperPatriot has other terrible memories, this time as he guns down Barbaric and Ricochet, an experience that startles the couple. Thunder-Head is killed in battle by Malcolm, Marsha is consumed by the Fire-Lords and Maxine once more ends up all alone. Despite these distractions, the various heroes are still able to finally end the alien threat. Malcolm and Battle Girl shut down the portal and teleport back to Earth to deal with the aftermath. Frustrated by the revelation that he and Angel Dragon as a couple is not more prevalent throughout the multiverse, Mister Glum opts to take drastic action. He opts to simply merge every single reality into his desired one, hoping that at least the love that his Angel had will survive. The multiverse is ended abruptly and everyone in existence suddenly has every single memory from their counterparts merged with their own. Dragon’s original universe is part of that and all of the various experiences he had are now shared throughout everyone he knows in his adopted universe too.